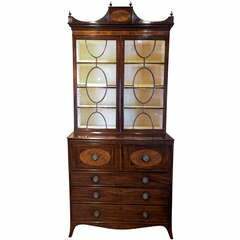 Regency satinwood secretaire bookcase, circa 1815. A fine quality satinwood secretaire bookcase, the upper section having a stepped moulded cornice above solid satinwood sides and twin doors that open on a pillar c hinge with inlaid glazing bars opening to reveal three adjustable shelves and raw silk lined back, the lower section has a secretaire drawer that has satinwood drawers with original turned Ivory handles pigeon holes and a newly leathered writing area, below are three long inlaid drawers with brass handles and this is standing on slender turned feet, this comes with two keys one that locks the upper section and one works all four lower section drawers, this has been fully professionally restored and hand polished to the highest standard, as to be expected with a piece of furniture of this age there are a few age related marks. 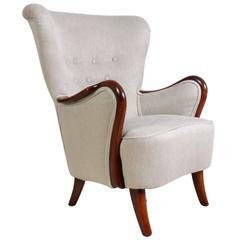 Age: circa 1815 Style: Regency Material: Satinwood Condition: Excellent Dimensions: 226 H x 85 W x 53 D cm. 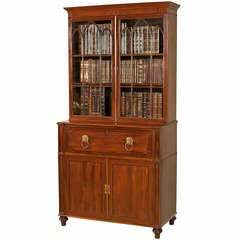 Baroque Revival Secretaire/Bookcase made of walnut and rootwood. 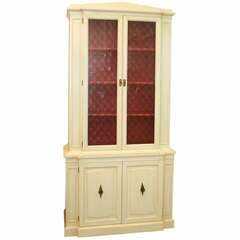 Two large glass front doors and interior shelves above writing surface and lower cabinet.